Arlington, VA — NAMI and 16 national organizations representing millions of Americans with pre-existing conditions filed an amicus curiae (“friend-of-the-court”) brief on April 1 in the U.S. Court of Appeals for the Fifth Circuit in the case Texas v. United States. This is the appeal of a District Court’s ruling to invalidate the entire Affordable Care Act (ACA). If the appeals court upholds the decision, the invalidation of the ACA would touch nearly every corner of the health care system and would be devastating for people with mental health conditions. Additionally, Medicare beneficiaries would lose free coverage of important preventive services and see possible increases in higher prescription-drug costs. Americans who have health insurance through their employer would lose their right to preventive services; lose coverage of children to age 26; and see lifetime and annual dollar limits of coverage reappear. NAMI will continue to fight for people with mental illness and urges the appeals court to overturn the lower court’s ruling and preserve health care for millions of Americans. The groups’ joint statement is below. You can read the full brief here. “The critical patient protections in the Affordable Care Act (ACA) provide an essential lifeline for millions of Americans who suffer from serious, acute and chronic health conditions. Their ability to access affordable, meaningful health insurance is critical to their health and wellbeing. “The lower court’s decision to invalidate the entire health care law threatens to resurrect barriers to health care for anyone with a pre-existing condition and could result in coverage being denied outright. Health plans would no longer be required to offer essential benefits necessary to prevent and treat a serious condition, and they could once again impose arbitrary annual and lifetime limits on coverage. Invalidating the law also would jeopardize the federal tax credits that make health insurance affordable for more than 8 million Americans, threatening their access to critical health coverage. “The ACA was intended to improve access to and increase the number of Americans with quality health care coverage. Since the law went into effect, millions more Americans nationwide are insured with higher quality health insurance than before the law was passed. Because of the ACA, there is already a small but statistically significant shift toward early-stage diagnosis for colorectal, lung, breast and pancreatic cancer in states that have increased access to health care through Medicaid. Additionally, in states that expanded Medicaid under the ACA the uninsured share of substance abuse disorder or mental health disorder hospitalizations fell roughly 15 percent from late 2013 to 2015. ♦ Mental illnesses are not the result of personal weakness, lack of character, or poor upbringing. ♦ Mental illnesses are medical conditions. ♦ Mental illnesses are treatable – 70 to 90 percent of individuals have significant reduction of symptoms and improved quality of life. ♦ Stigma erodes confidence that mental disorders are real and treatable. It is time to take these barriers down!! illness or substance use disorder during their lifetime. 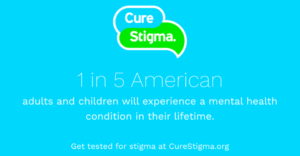 One in four Americans experience mental illness each year. Mental health and substance abuse conditions cause more burden of disease than any other health condition – twice as much as cardiac disease.